Internet Brands July 2, 2018 Comment Now! The X4 M40i's wonderful inline-6 cranks out 355 horsepower and 365 pound-feet of torque. It accelerates from 0 to 60 mph in just 4.6 seconds, but the passing oomph in the 50-70-mph range is most impressive. The base X4 xDrive30i is propelled by a 2.0-liter turbo-4 that makes 248 horsepower and 258 lb-ft of torque. It is more than adequate for a vehicle of this size. With either engine, the only transmission is an 8-speed automatic and the standard top speed of both vehicles is an electronically limited 130 mph. 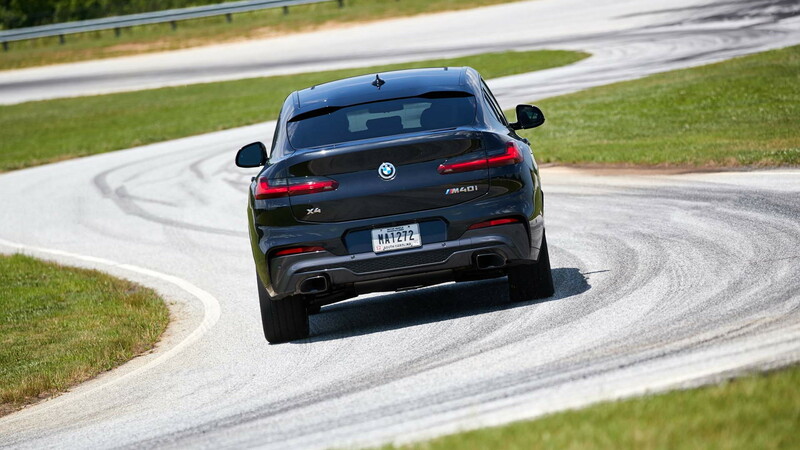 X4 M40i buyers can choose higher-speed-rated tires that permit a 155-mph top speed. EPA fuel economy numbers are not yet available for either configuration. 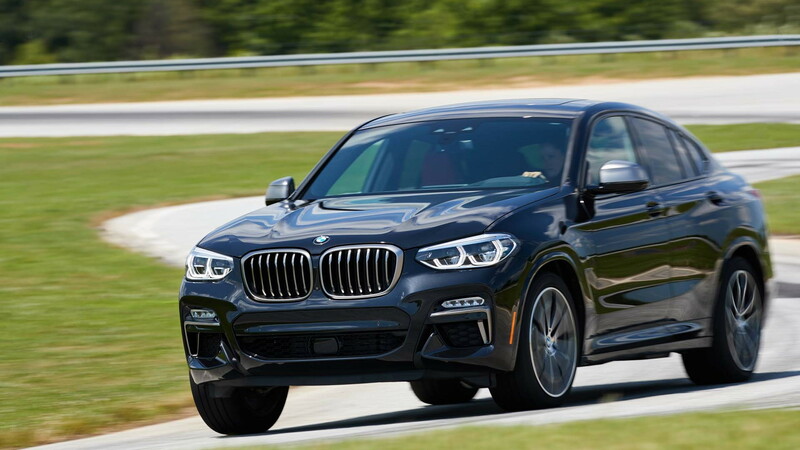 The X4 M40i rolls on 19-, 20-, or 21-inch wheels, and my test car’s 21-inch wheels were wrapped in 245/40R21 front and 275/35R21 rear tires that can come from any of several of BMW’s tire suppliers. With the 21s, the X4 demonstrated impressive grip and excellent turn-in response. Combined with BMW's deft suspension tuning, handling in the curves far exceeds anything that seemed possible for a tall SUV-like vehicle until very recently. Even more surprisingly, the X4's ride is as comfortable as its handling is sharp. Like the i-Pace, the X4 proved to be up the to task of tackling mountain roads. 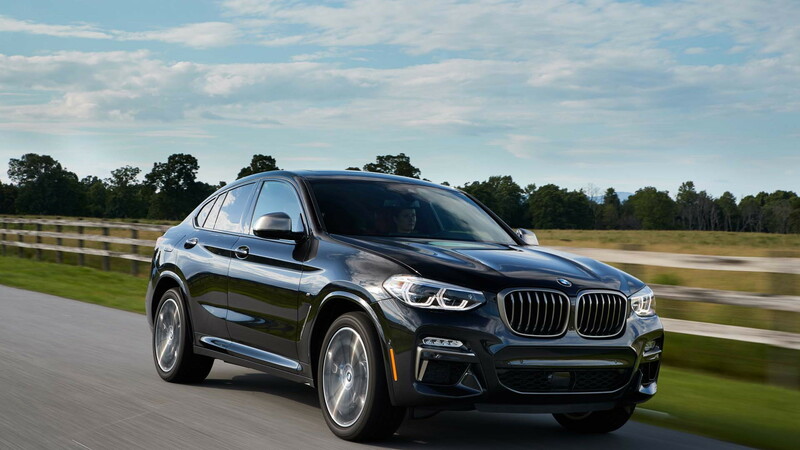 Charging into tight corners, the X4 stops its hefty 4,323-pound curb weight effortlessly, with unbranded four-piston front calipers and two-piston rears. Pedal effort is light. It helps BMW’s cause that the high seating position that attracted some drivers to SUVs is gradually settling a little closer to the lower position of cars, as SUVs increasingly embrace the longer-lower-wider trend that cars followed when they switched to unibodies in the 1960s. Crossovers like the X4 share the unibody construction of cars. The 2019 X4 stretches three inches longer than the outgoing model, with an extra 2.1 inches of wheelbase and 1.4 inches of width. The coupe-like roof is only a tenth of an inch lower, but the lengthening and widening visually lowers the car more than that. The X4’s sheet metal is crisply modern, with what BMW terms “clean surfacing.” This is a big change from the days of overwrought “flame surfacing,” and BMW continues to improve its styling as the previous design language recedes in the rearview mirror. The X4 is especially improved, as BMW grapples with what, exactly, it means for a four-door crossover SUV to be called a coupe. It was born from its X3 crossover sibling and BMW identifies it as a coupe with the requisite fast roofline. With this latest design, the X4 is making progress toward conventional standards of beauty for a coupe. 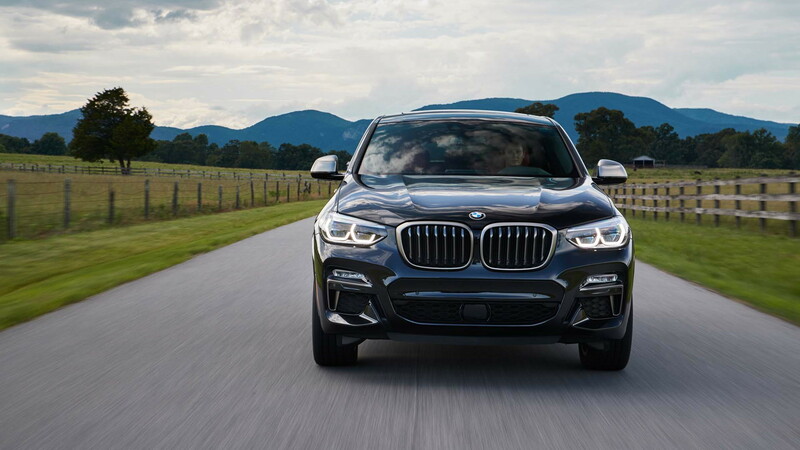 The grille and front end present a pleasing face to the world, and the sides have some nice detailing for character despite the slab sides dictated by the pursuit of aerodynamics; the X4 sports a 0.30 coefficient of drag. The hatchback’s profile remains vaguely cetacean, though not as much so as its predecessor and the larger X6. The cabin is handsome and nicely appointed, with a low dashboard that cultivates the driver’s impression they are sitting higher than they actually are. Materials quality looks and feels good, and most of the switches are identifiable and easy to use. A standard panoramic sunroof stretches overhead, giving the 2019 BMW X4 an airy, well-lit atmosphere. The added weight of that expansive glass panel must surely contribute to some degree of top-heaviness, but if it does, the X4’s suspension hides it so well that I could not detect it from behind the wheel. The X4 M40i's sport seats are worthy of note, thanks to heavily bolstered side cushions that keep occupants in place during the kind of spirited driving the vehicle really can execute. That support is particularly relevant because the X4 has no overhead handles for passengers to grab when the driver is slicing up the curvy mountain roads just north of Greenville that attract so many cyclists to the region. Although the X4 is a compact crossover, the rear seat provides ample space for a six-footer to sit behind another six-footer without knees against the back of the front seat or head contacting the headliner. The compromise for that coupe shape comes in cargo space. The X4 offers 18.5 cubic feet of cargo volume with the rear seats up and 50.5 cubic feet with them folded down. That compares to 28.7 and 62.7 cubic feet in the X3. A price must be paid for style. 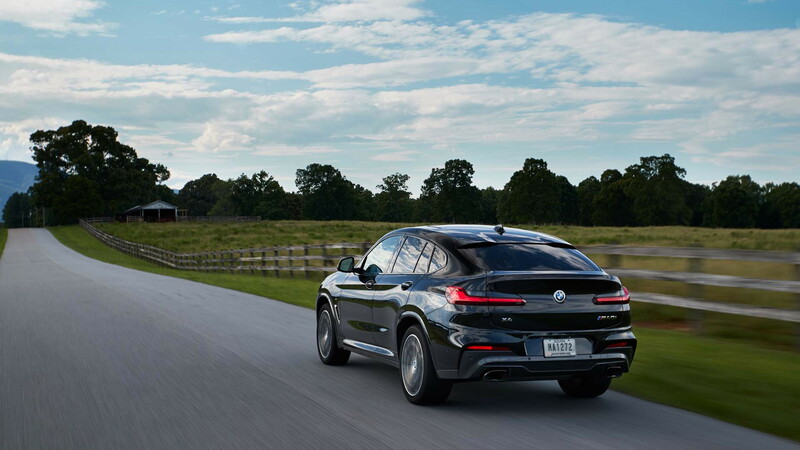 The X4 boasts a commendable array of safety technologies as standard, including forward collision warnings with automatic emergency braking and pedestrian detection, and speed limit information, all of which got through the day without a false alarm. Once again, BMW delivers its version of a driving machine. Now that it has settled in as an SUV-market native, this marriage of responsive handling and SUV size and space will likely begin to seem as natural as kudzu in South Carolina. The 2019 BMW X4 is on sale now, with a base starting price of $51,445 (including destination charge) for the X4 xDrive 30i and $61,445 for the X4 M40i. BMW provided travel and lodging for the Internet Brands Automotive contributor to bring you this firsthand report.